DISREGARD all the confected agonising about a few percentage points less in GDP growth over ten years. Ignore the un-evidenced predictions about job loss Armageddon. 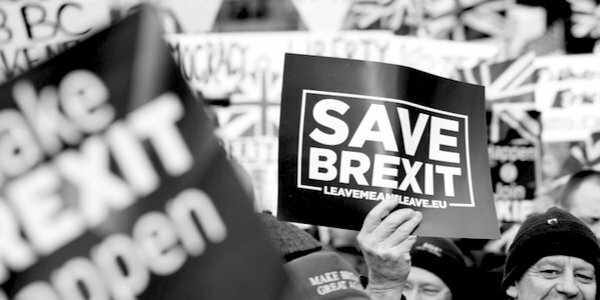 Ever since the mid-February 2016 announcement of the EU Referendum date, the Remain campaign has been throwing economic sand in our eyes: because it knows that, on the key Brexit question, that of sovereignty, independence and democracy, it has no case. Some things in life really are simple, but just not easy: the words aren’t synonymous. Especially in politics, however, some simple things are deliberately over-complicated by those who need to obfuscate them in pursuit of an agenda. Brexit is actually a very simple, almost atavistic, existential question, arguably the oldest one of all. How are we to be governed, by whom, and from where? Do you want to be governed by people whom you can elect and can throw out? Or ruled by people whom you can neither elect nor throw out? Huge numbers of the 17.4million who voted Leave, despite being disparaged as uneducated, stupid and bigoted, actually understood this, instinctively and viscerally, even if they couldn’t all necessarily articulate it lucidly. They knew what was, and still is, at stake. That’s why ‘sovereignty and democracy – the principle that decisions about the UK should be taken in the UK’, easily topped the polling of the reasons why people voted for Brexit. As one said to me: ‘I’m voting for Brexit so that my children, and in turn their children, can live in a society where the laws they have to obey, and the taxes they have to pay, are decided by, and only by, people whom they can elect and can throw out, and by no one else.’ As a justification, I’ve yet to hear that bettered. Remember, Brexit was the biggest vote for one single, specific policy in British political history. Three million people voted who don’t normally bother or who hadn’t voted before. Why? Because they recognised it had a significance far, far greater than mere elections: because it was a nationwide, whole-electorate poll, where they knew that this was one of the few times in their lives when their individual votes actually counted, and made a difference. But the overwhelmingly Remainer-dominated political class has cynically and calculatedly betrayed them, with tacit support from swathes of people on the losing side. The really shocking aspect of the last thirty-three months has been the exposure of just what a precariously thin thread British democracy hangs by, not just among the Establishment-Elite, but also apparently among a sizeable proportion of the electorate, when it delivers an outcome uncongenial to them. After the past week’s events, there can no longer be even a scintilla of doubt that Parliament has now consciously voted to set itself against the people. It is trying to steal from us the very decision it asked us to make, because it does not like it. It is behaving like a thief in the night, breaking in to a poor man’s house to steal the one thing of value he has: his vote. It has, quite simply, declared war on the electorate, on Brexit, on democracy, even on the Constitution. It has, in effect, shredded the social contract. Last July, just after the revelations of May’s Chequers deception, I wrote on TCW that this had just got a lot bigger than Brexit: that it was now about nothing less than whether we are a functioning citizens’ democracy at all, or just unwilling, powerless subjects of an unaccountable apparatchik-elite pursuing its own agenda. We have to prevail. The alternative is too baleful to contemplate. That’s why we need to rally in Parliament Square today. Not just to reclaim Brexit from the MPs who have stolen it, but to reclaim our democracy too.